Different kinds of holes, gaps and other empty spaces. An abyss is a space that you cannot measure how deep it is. 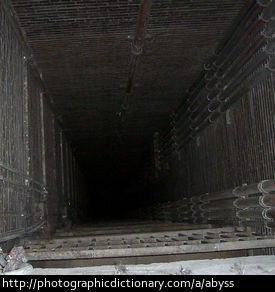 It can also be used to refer to anything you cannot measure or comprehend, eg "the abyss of the soul". A bore is a kind of drilled well. Water is drawn up from underground through the bore hole by some kind of pump. 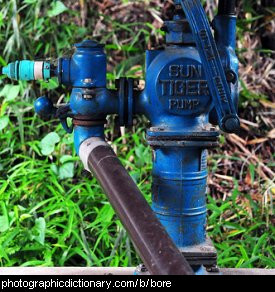 The pump can be an electric pump, a hand pump, or a wind driven pump. 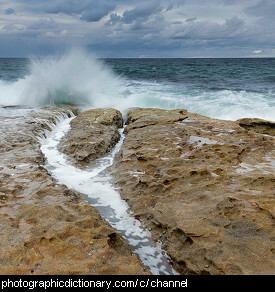 A channel is a waterway, or a path that has been worn by water. Channels can be so large you can't see the other side, or quite small, like a gutter by the side of a road. The picture is of a channel that has been worn into the rock by the waves of the sea. 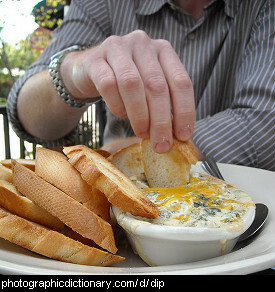 A chasm is an extremely deep hole or fissure in the ground. 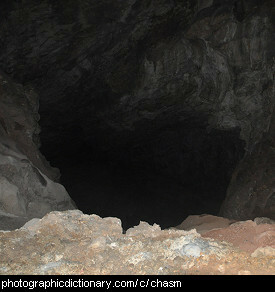 Chasms are usually very large, big enough for a person to fall into. A cleavage is the hole left after you cleave something. More commonly though, a cleavage is the space between a woman's breasts. 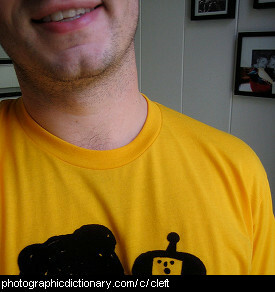 A cleft is a hole between two parts of something, similar to a cleavage. The man in the picture has a cleft chin. A crack is a long, thin break in something. 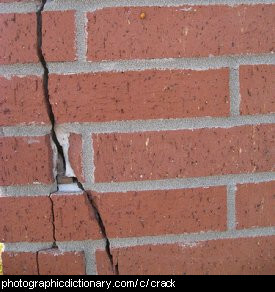 Cracks are usually found in something big and hard, like a wall or a concrete building. A crater is a large, circular hole in the ground that could have been caused by several different things. Craters can be many kilometers wide and very deep. 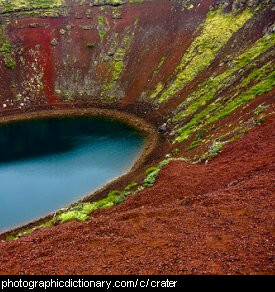 Craters are found on top of volcanoes, and they can be caused by meteors hitting the Earth. They are sometimes caused when the ground collapses above a large underground chamber like an old mine or a cave. A dent is a hollow, like a shallow hole in a surface. 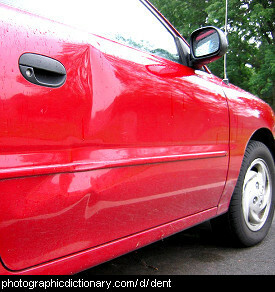 Dents are usually caused by hitting something. The car in the picture has a dent in its side.